„The success of „The Wandering Earth“ indicates that China’s sci-fi is to evolve from solely literature to complex creative forms including film production, said Wu Yan, a professor with the Southern University of Science and Technology. Wu attributed the progress to four factors: high-quality works, an expanding market, steady financial input and growing sci-fi fandom. Apart from the fascinating story and eye-catching special effects, the film’s interpretation of traditional values about family, heroism and patriotism also resonated with the audience. „I was strongly inspired by the three fathers in the film, all of whom made sacrifices for the greater good and showed true devotion for their families,“ said Fan Xinggang, a father of a three-month-old from Xi’an, capital city of northwest China’s Shaanxi Province. „Liu Cixin was born on 23 June 1963 in Yangquan, Shanxi. Liu’s parents worked in a mine in Shanxi. Due to the violence of the Cultural Revolution he was sent to live in his ancestral home in Luoshan County, Henan. Liu graduated from the North China University of Water Conservancy and Electric Power in 1988. He then worked as a computer engineer at a power plant in the Shanxi province. Liu is married and has a daughter. His wife and daughter almost never read his works. Liu cites British authors George Orwell and Arthur C. Clarke as important literary influences. He was labeled the first cyberpunk Chinese author after his novel, China 2185, was published in 1989. Es gibt noch weitere chinesische Sci-Fi-Blockbuster, diese aber mehr für den chinesischen Markt.Interesant, wenn einmal ausserirdische ZIvilisationen mit der Menschheit in Kontakt treten, diese nicht als Invasoren kommen, sondern diese wie in „Crazy Alien“ ihren Botschafter ausgerechnet über den Westen abwerfen, bei dem dieser für einen Affenmenschen gehalten wird und von einem Unterhaltungskünstler als Zirkusattraktion auftreten gelassen wird. Diese primitiven Westler–wäre der ausserirdische Botschafter über China abgeworfen worden, wäre er wahrscheinlich würdig empfangen worden und hätte China eine win-win-Situation und eine neue, kosmologische Seidenstrasse mit ihm ausgehandelt. Jedenfalls wird den Westlern da kein Einfühlungsvermögen in andere Zivilisationen zugetraut, was ja auch nicht ganz falsch ist, wenngleich der chinesische Hanchauvinismus ja bezüglich Arroganz und Überheblichkeit sich da vom American exceptionalism nicht sonderlich unterscheidet. Wahrscheinlich wäre der exterristische Botschafter von den Chinesen auch nur als Barbar und Langnase empfangen und als solcher behandelt worden, vielleicht nur insofern freundlich, wie er Feind gegen die Weltmacht USA sein könnte, deren Stellung China ja übernehmen will.Motto: Der Feind meines Feindes ist mein Freund-Aliens willkommen. 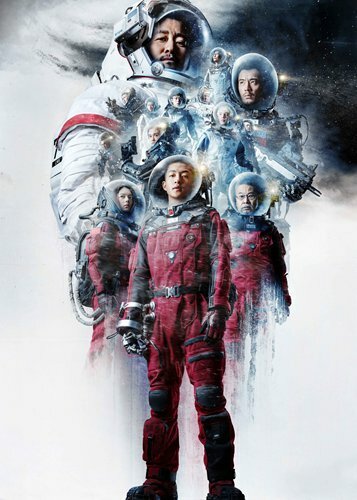 The Chinese mainland’s home-grown sci-fi blockbuster, The Wandering Earth also began a limited run in North America on Friday, even though director Frant Gwo told the Global Times that he considers the film „made for Chinese audiences“ and not the international market. So far the film has a high grade of 8/10 on IMDb. „America producers, eager to get their $200 million movies into the lucrative Chinese market, are increasingly looking for Chinese production partners, shooting in Chinese locations, and adding China-friendly characters and plotlines to American movies, even including extra scenes just for the Chinese cuts of films. But simultaneously, China and other countries are moving toward the blockbuster model themselves, creating homegrown films that don’t need to involve American partners at all,“ The Verge wrote in its review of the film on Saturday. 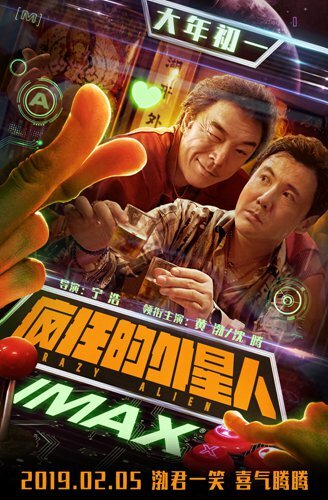 While The Wandering Earth tackles Hollywood’s familiar end-of-the-world genre head on, Crazy Alien stood out for its ability to mix Chinese-style comedy with Hollywood sci-fi tropes. The film starts with a leading Western power contacting an alien to establish diplomatic relations, when the alien ambassador is accidently dropped onto the Earth and is mistaken for a monkey by a local entertainer. The debut of two Chinese sci-fi films at the same time is not a coincidence. According to Gwo, a group of local directors, including himself and Crazy Alien director Ning Hao, studied in Hollywood years ago and were deeply impressed by the industrialization of film production there and aspired to adapt it to the Chinese market. Gepostet am Sonntag, Februar 10th, 2019 um 15:48 in Allgemein | RSS feed Kommentare und Pings sind zurzeit deaktiviert.